A second helping of easy to follow mini-workshops and step-by-step demonstrations from the Yamaha Club archive. 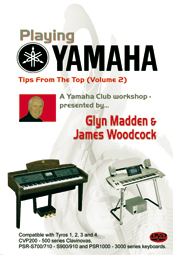 Glyn Madden and James Woodcock present a further selection of hints and tips as they answer some of the Yamaha player’s most frequently asked questions. Commercial files and home recording. Creating a 'cymbal crash ending'. Backing up the hard drivbe of a Tyros arranger keyboard. Expansion Memory (about DIMMs and Flash Memory modules). Yamaha PSR-1000, PSR-1100, PSR-1500, PSR-2000, PSR-2100, PSR-3000, PSR-S700 and PSR-S900 series, Tyros (1), Tyros2, Tyros3, Tyros4 and Tyros5 keyboards. (UK PAL format only. Region Free! ).